Father's Day jumbled letters puzzle to support problem solving strategy development, brain engagement, and helping to consolidate spelling of theme related words. To solve the puzzle, review the list of Father's Day words in the word bank at the bottom of the page. Next, review the list of scrambled letters. Compare the word list in the word bank with the question and print the unjumbled word on the line provided. 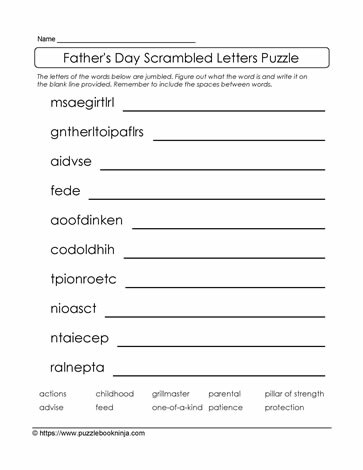 To challenge the brain more, hide the list of words and using knowledge of letter patterns in words and Father's Day vocabulary, unscramble the words.